One of my favorite times of the year is that in-between holiday stage. 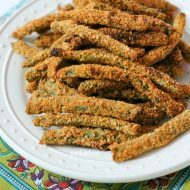 I like to create yummy holiday recipes, and that means those creations spill over between Thanksgiving and Christmas. 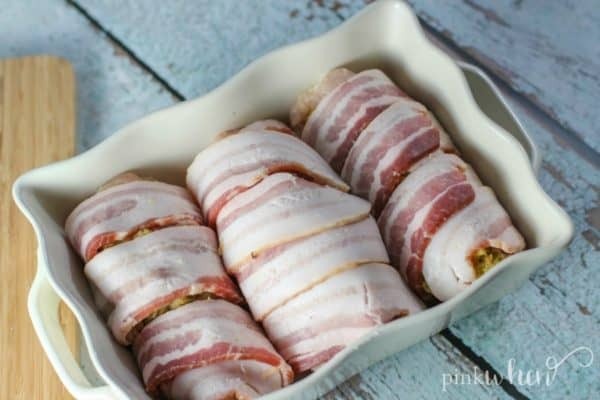 This Bacon Wrapped Chicken Breast recipe is no exception. I am going to talk to you in a minute about bacon because not all bacon is created equal. If you follow my Instagram, you know I took a trip to an Iowa pig farm over the summer. It was there that I learned so much about our food industry, and about bacon. Wright Brand Hickory Smoked Bacon products use only the best to create the thicker, fuller-flavored slice of bacon they are known for. They also know what they are doing because they have been around for almost 100 years. How do I know it’s the best bacon? My 7-year-old asks for it every morning for breakfast before school. Step one for creating an amazing dish is to create it with thick hand-cut bacon. And be sure your packaging has the Wright Brand on it! You can find it located in the refrigerated aisles at your local Albertsons retailer, and look for the yellow coupon offer. 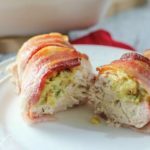 Bacon wrapped chicken has been around for a while and stuffing a chicken breast has, too. But have you tried a Thanksgiving knockoff of Bacon Wrapped Stuffed Chicken? You can make this with bread dressing, chicken breast, and Wright Brand Hickory Smoked Bacon. For this recipe, we are going to pre-heat the oven to 375 degrees Fahrenheit. Take the chicken breasts and make sure they are clean and dry. It makes for much easier cutting. If you haven’t done so already, prepare your favorite dressing recipe. This is what we will be using to stuff the chicken. Carefully slice the chicken in half, lengthwise. 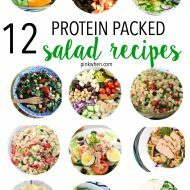 Take your fully cooked dressing and stuff the chicken. 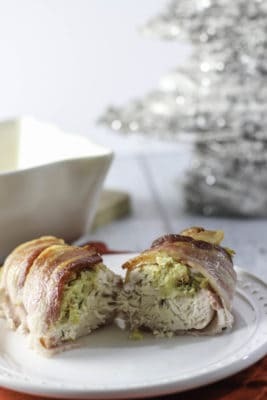 Once you have the chicken stuffed with the dressing, it’s time to take the bacon and wrap it around each chicken breast. 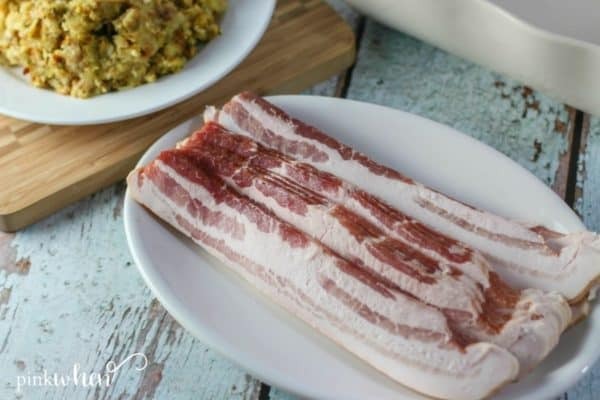 Typically when I make this recipe, I will use between 3 and 4 slices of bacon. Once I wrap one piece around, I start the second piece by overlapping the first piece just a little. This helps the bacon stay in place and stay wrapped. I also like to place my chicken breasts in a dish that fits them perfectly. That way during the baking process they will stay together easier. 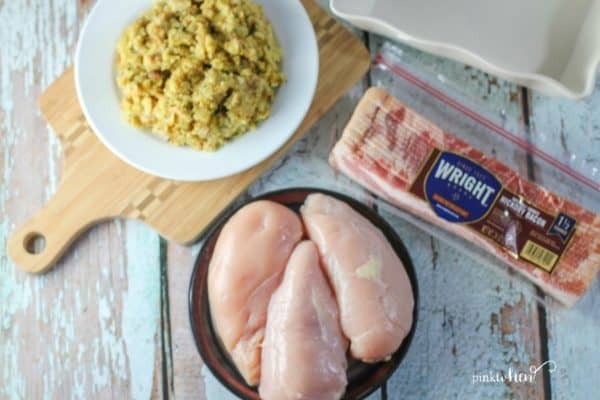 After you have all of the stuffed chicken breasts wrapped with bacon, place them in the oven for one hour, or until the chicken is fully cooked and reaches an internal temperature of 165 degrees Fahrenheit. Allow the chicken to cool before serving. 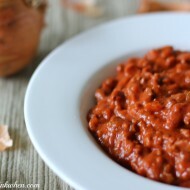 This is such a delicious meal to serve during, or in-between the holidays. When you make it, make sure to grab the Wright Brand Hickory Smoked Bacon. It’s the best thick-cut, hickory flavored bacon, and you can find it at your local Albertsons retailer. 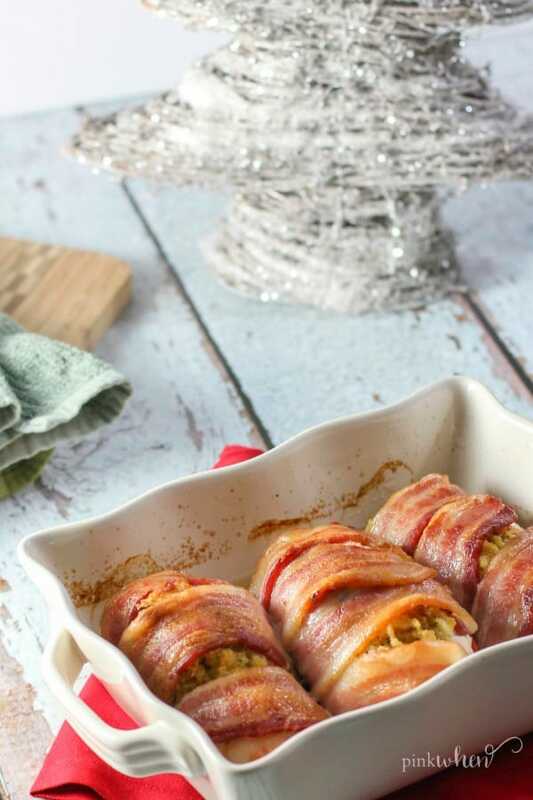 This bacon wrapped chicken is the perfect chicken to serve during the holidays. Stuffed with your favorite dressing, and wrapped in thick-cut hickory smoked bacon. Slice the chicken breast lengthwise. Add the dressing to the chicken breast. Close as best as you can. 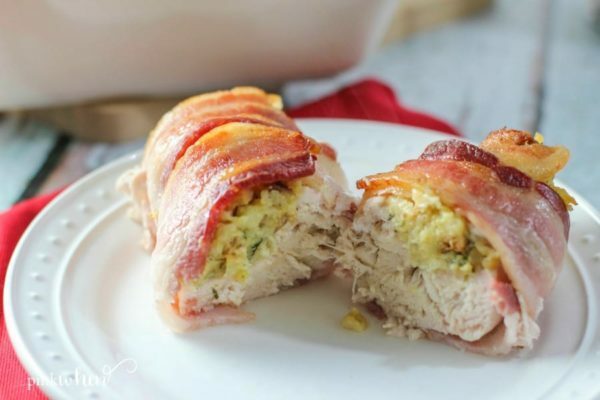 Wrap the bacon around the stuffed chicken breast, layering the bacon edges as you wrap. Bake in the oven for 1 hour, or until internal temperature reaches 165F. Remove from oven, allow to cool for 5 minutes.